The 2018 Youth Media Awards taught us a few things: age is relative, small can win big, and award winners reflect the times. I’ve said it before, and I’ll say it again. The true delight of the ALA Youth Media Awards (YMAs), when it all comes down to it, is how it’s anybody’s game right up until that announcement. Now that the dust has settled, let’s take a step back and consider this year’s lessons. 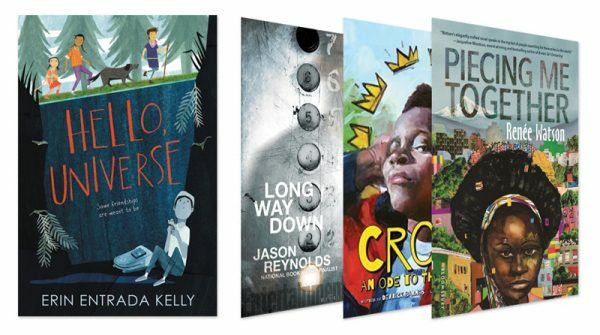 IN WEAK NEWBERY YEARS, COMMITTEES WILL SELECT THE UNEXPECTED There were plenty of great middle grade novels (and some magnificent nonfiction as well) in 2018, but far fewer than you’d expect in a given year. Bearing this in mind, the 2018 Newbery winners typified a Wild Card Year, where nobody saw the final roster coming. Two honor books on the list (Long Way Down by Jason Reynolds and Piecing Me Together by Renée Watson) were published as young adult novels, while the remaining honor title (Crown by Derrick Barnes) was a picture book. With its odd age range of 0–14, the Newbery has always awarded the occasional YA title here or there. What made it different this year was the simultaneous inclusion of a picture book honor. It’s like they all say: Age is relative. SMALL PUBLISHERS ARE SEEING AN UPTICK IN SUPPORT FROM COMMITTEES Whether it was Agate Publishing, Capstone, Pajama Press, Cinco Puntos Press, NorthSouth Books, or any of the other houses, small publishers were the clear-cut winners of the year. To what do we credit the sheer number of small and independent publishers winning major awards in 2018? If I were to guess, I’d say it was a combination of better publicity tactics, higher quality books, and the bravery to meet the needs of the reading public that the bigger publishers ignore. YOU DON'T HAVE TO MAKE A STATEMENT TO MAKE A STATEMENT Donald Trump has been president for a little more than one year. Do the current award selections reflect the state of the United States in the 21st century? Consider the Caldecott winner. In Wolf in the Snow by Matthew Cordell, a girl and a wolf, shown in bubbles, have to break down barriers and perceptions of differences to reach a common goal. Compassion beats fear. As for the Newbery winner, Hello, Universe by Erin Entrada Kelly features a big, blond boy, who is a bully. He likes himself a lot but really enjoys knocking down anyone around him he deems different. He’s also very unnerved by a strong female character who isn’t intimidated by him. Do these books have something to tell us about the times in which we live?